When it comes to your wedding day, there are many feelings and emotions that spring to mind. Many couples feel as though they are starry eyed, bowled over by the nature of the day and the amount of positivity and good wishes that they experience from their guests. There are also lots of dreams associated with a wedding day as the bride and groom look forward to spending the rest of their life together. The day and marriage itself is likely to be the culmination of one dream but it is also the starting point for new dreams and opportunities. This means combining these two aspects together into a “stardream” could be the ideal way for couples to get across their joy and happiness at their big day. This is exactly what is on offer with the Stardream wedding invitation from Chapter One, which comes with foil gold text on a crisp backing card. This creates a stylish and highly attractive invitation that provides guests with a pretty keepsake, and all of the information they need to plan for a brilliant day. There is a choice of over 10 colours for your ribbon, so if you have a colour scheme for your special day, you’ll find it easy to set the tone from the start with these invitations. All of the cards are supplied with lengths of ribbon which means that every invitation can be bound, adding an additional personalised touch for your invitation. 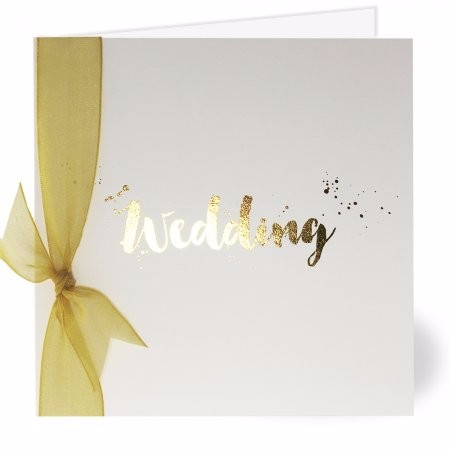 With a full range of stationery in the same style, it is possible for the happy couple to correspond in this manner before, during and after the wedding.